But it was Republicans who made bigger gains. While both parties in the 113th Congress — which spanned 2013 and 2014 — were below the average for all senators during the last 20 years, GOP senators in the 114th Congress had a score slightly higher than the average (after controlling for which party was in the majority). Democrats remained lower than the average for all minority senators during the 20-year benchmark period. The Lugar Center uses a formula that rates each member of Congress on how bipartisan they act based on cosponsorship of bills. The score objectively factors in how often members sponsor bills that attract support from across the aisle, as well as how often bills they cosponsor were originally introduced by members of the opposite party. It also uses a measurement the center has dubbed the “bipartisan intensity” of bills, which grows as more members sign onto a bill who are not in the same party as the bill’s sponsor. The scores in the 114th Senate represent the second overall uptick in a row, following the extremely partisan 112th Congress. 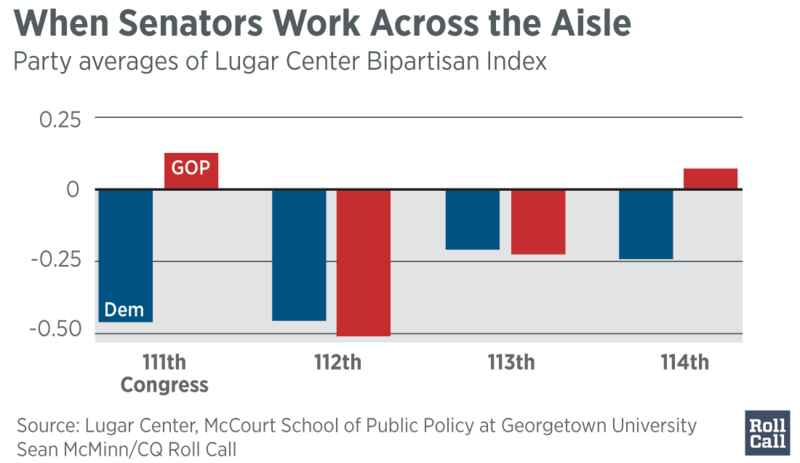 That Congress, when gridlock overtook Washington following the wave of far-right Republican winners in midterm elections, was the least bipartisan the center has on record, said Dan Diller, the director of policy at the Lugar Center. Since then, “especially in the Senate, there were impressive figures in the number of senators who improved,” Diller said. Democratic Sen. Joe Donnelly of Indiana came in second — one of only three Democrats in the top 10. Last in the rankings was Sen. Bernie Sanders, one of the two independents in the chamber. Sanders, who caucuses with Democrats, spent much of the 114th Congress on his failed run for the Democratic presidential nomination and developed a nationwide reputation as a staunch liberal. Republicans Ted Cruz of Texas and Richard C. Shelby of Alabama joined Sanders near the bottom of the rankings.